This was one of the hardest shows to get tickets for. Still, if you were in Munich city during yesterday and today, and followed the advices on the IORR Tell Me pages, then you should actually have got your tickets, as they sold 200 tickets yesterday at 7-11am in the morning, and then another number of tickets this afternoon. So I am happy for everybody who made it into this fantastic show - it was one of the shows that people will talk about for a long, long time. The "Circus Krone Bau" is actually a circus building; a real classic circus building where the Krone circus play during the winter season. These days it is also a concert venue, with space for around 2,400 people. It is all wooden inside, and it is extremely hot, as all the hot air from the crowd just stay inside the building - not really any proper air conditioning. The lights went out at 9:35pm. I had been watching my clock for half an hour by now. Mick's microphone was in place at 9:25pm. I was more than ready. Then it was called back five minutes later. Mick wanted to have it in hand as the opening song started. Few minutes later I heard the voice of the tour boss Michael Cohl, not on stage, still announcing the band in classic terms: "Ladies and Gentlemen, The Rolling Stones are now finishing the trilogy of their Munich shows - Welcome to Circus Krone! And by 9.35 Keith walkes on stage, "Jumping Jack Flash" is on. The crowd is wild of course, and they stay wild throughout the show. "All Down the Line" is giving us a fantastic solo by Ronnie. "Sweet Virginia" is a true beautie. Then the song that I loved the most for tonight: "Worried About You". Mick is sitting in on an electric piano. Just a few feet away from me, on the left side of the stage. He is singing this fantatic falsetto voice: "Sometimes I wonder Why...". His face is making all these mimics. Then more falsetto. Then up-tempo. His voice have never sounded better. Then he leaves the piano, Blondie takes over, and Mick is grabbing a white towel. He moves to center stage, as he starts swinging the towel like a south american football fan is swinging his T-shirt. Then he is throwing it, not into the crowd, of course, but back onto the stage. The crowd is all wild by now, and I am sweating like crazy. "Stray Cat Blues" is next. Another great work from Ronnie. Then Darryl is making a "guest spot" on a genuine bass solo. Mick is saying they used to play the next song many many years ago before he was born, at the time The Stones played Krone in the 60's... And we get "Everybody Needs Somebody To Love"! "That's How Strong My Love Is" was not as "freaked out" as it was in New York during the Roseland show, but then again the New York crowd missed one imporetant part of this song! As it expired, Charlie jumped his drums and made us another great start of this song. 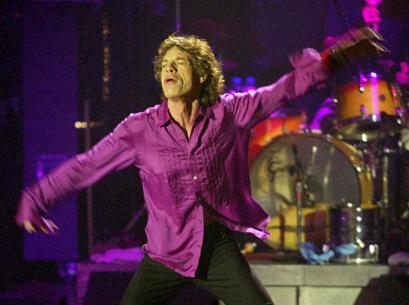 Mick had some extra energy left, luckily, and we got a whole extra verse of the song. Fantastic! Mick did the introductions. All the energy spent on the previous songs had made his mind swing a bit. When finished introducing the horn section, I saw his eyes went around in circle a few times. Then he tried to figure out what planet he was on. Then he said: "Oh, then we have the vocals...", and he introduced Bernard, Blondie and Lisa. Charlie got another great ovation from the Munich crowd. Mick loved it, as he decided he should treat Charlie special tonight. He took his microphone, handed it over to Charlie, and for a change, for a rare and unusual moment, Charlie actually spoke a few words into the microphone! I could not hear what he said, but if someone with a good ear for what he said is able to tell what he said, then we would be happy to know! Keith got an even bigger ovation. It would never end. Eventually he said something like: "You bastards", with a great smile, "I have a show to do!". Then he said he would do a song from 1941. And he did "The Nearness of You", the one I told you about which they did at the rehearsals in the Olympiahalle on Tuesday - the day before the tour start. And it sounded great! Why hide away this beautiful ballad for so long? Now we got it - time for others to get it too! "Can't You Hear Me Knocking" fitted perfectly into the set. Bobby and Mick did an excellent job, and Ronnie proved he is the king of the guitar on this song. It started good, continued in an excellent way, and then he added some outstanding licks for the final bit. Never heard anything like it, but it was great! "I Can't Turn You Loose" I am sure all other fans going to this show will tell you everything about. Normally this is a standard sing-a-long party song, but tonight it went on and on. The crowd screamed for more. The band had more to give. And they did it again. And the crowd screamed for even more. And they did it the 3rd time. Then we were all exhausted. I had sweated like 2-3 liters during this two hours set, I rushed for water, and I am still drinking water hours after the show is over. It was so great, it was so hot. All I can say is thanks to the Stones, hoping the next show in Milan will amuse and excite all the Italian fans just like I was satisfied tonight! PS. We did not have any guest artists tonight, but I did not miss them. All I needed is what I got - The Stones! What a hell of a show tonight in Downtown Munich. It has maybe 40 degrees or a little bit more. But the hottest guys tonight were the boys on stage. I don't have the right words to say what was going on at the Cirkus tonight, it was just amazing. They started with a rocking JJF and from this point the level never felt down, not a minute. One highlit after another and after 36 shows since 1976 tonight I heared songs that I never heared before live. So thank you guys for the Munich Triple. I went to a Rolling Stones show and didn't get any "Satisfaction." Instead I got an unforgettable concert where the band rolled out a set of obscurities that had been performed in the U.S. clubs, but took on a life of their own in a remarkable venue packed with truly appreciative fans. Fans of Otis Redding and Hoagy Carmichael would have been ecstatic. The Stones played Otis' version of "That's How Strong My Love Is" and encored with "I Can't Turn You Loose." The Roseland rendition of the former is still the one to match, but the crowd was 10 times better than at that New York club. And the false ending heightened the tension of the dramatic song. The last time I saw "I Can't Turn You Loose" was at Giants Stadium, and it fell rather flat. I don't think the Munich audience was overly familiar with the song either (maybe because of the poor vocals), but it will surely be ringing in their ears for days to come. Mick stalked the tiny stage delivering the message in full pleading mode. The song ended, it started up again, Mick left the stage at the end to towel off. But the band started it up yet again, and he returned to the stage like a victorious athlete taking a victory lap. It was a seminal moment as he jumped up and down on the spot towel in hand, singing the chorus, while the sweaty crowd on the floor surged ever forward to hail the all-conquering hero. There was no way that song could be topped by a mere masterpiece such as "Satisfaction," and so the concert ended just short of the 2-hour mark, and we filed into Munich's empty streets in vain search of some Sunday nightlife. But that's another story. Keith, earlier, had dusted off Carmichael's "The Nearness of You," and seemed to accomplish a personal milestone in the process, so proud was he of debuting this jazz nugget. Halfway through the tune, he mumbled, "I love this song, y'know!" Afterwards, as applause rang throughout the club, he noted, "Bless you all ... Get me an apartment here ... Gold rings on you all." It almost looked as if he was wiping away a tear, but he was probably just scratching an itch. Other highlights included "Can't You Hear Me Knocking," where Ronnie's neverending blistering solo inspired Darryl Jones to walk across the stage and hug the surprised guitarist at the end of the song. 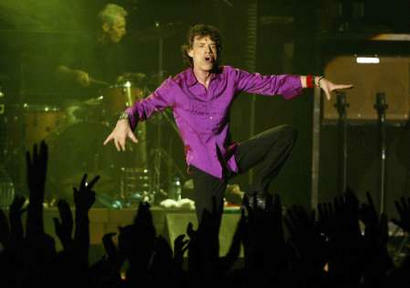 As much as the Stones were the stars, the crowd was definitely a key component. In fairly unbearable conditions, they remained upbeat and enthusiastic, and no one acted like a jerk (well, not around me anyway). One small point, and I may sound like a jerk, but it would be nice if they could debut a few extra songs. I think we can banish "Dance Pt. 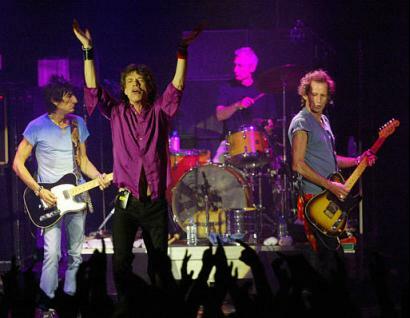 1" now, and maybe one or two of the stadium songs like "Tumbling Dice" and "Honky Tonk Women." Speechless, breathless, amazed. Those 3 words probably describe lil ole me after this incredible show. I was expecting a lot but certainly not as much as I got at the Cirkus Krone tonight. After listening to the soundcheck (from 5-6pm) I already knew we were going to get a few treats. Worried About You got me all teary eyed (well, not really, but you know what I mean), you have no idea how bad I've always wanted to hear this song and now I finally got it. The overall sound was amazing, the venue was beautiful, the song selection was great and except for some wannabe celebrities who were moving back and forth without any reason (other than maybe trying to be important LOL) it was the best show I have ever seen. Mick went totally nuts and was obviously digging the crowd reaction to songs like That's How Strong My Love Is and Can't Turn You Loose (didn't like that one in the States by the way....but it is the PERFECT encore for a club show...let me tell you that). I could have done without Honky Tonk Women and Tumbling Dice but then again they had to play some of the 40 Licks stuff. Setlist-wise, Roseland was still the better gig but performance-wise this third Munich show was a lot better than the famous NYC club gig. PLUS, how many times do you see Charlie Watts with a microphone in his hands, talking to the audience :) ?! I think he said something along the lines of THANK YOU, but nobody really understood what he was saying. Who cares, the man was speaking to us, that's what counts. It was hot as hell inside the Cirkus Krone as Mick commented on a few times ("hot, hot hot, hotter than Toronto") but somehow my friend Charlie and I liked the heat in a weird way. I was completely soaked after the show, I've never sweated so much in my entire life, but it was worth every last second. After shows like these I know why I love them.....See ya all in Berlin ! P.S Let me thank Keith for FINALLY NOT playing Slipping Away but treating us to a great rendition of Nearness Of You. For news links and general press reports see the separate IORR Munich pages!